Go Birdwatching with a Birding Pal from Florida. Welcome! I live on Amelia Island in Northeast Florida. I have enjoyed birding and photography for over 10 years in this area (NE Florida, SE Georgia) and am a Florida Master Naturalist. In addition to Amelia Island, great places to visit nearby are Huguenot Park, Talbot Island, Cumberland Island, Okefenokee Swamp, Anastasia Island/St. Augustine and Crooked River SP. I am bilingual in Spanish and have a 4wd vehicle that helps especially if one has limited mobility. Cape Coral is home to the largest population of the Florida species of the Burrowing Owl in the world. Sightings 99% guaranteed. Side trips to see the endemic, endangered Florida Scrub Jay also available. Tours available November through May only. I belong to the Calusa Birding Club. Interface b'n sub/tropical zones, Brevard County (FL) is a birdwatcher's paradise: Pandionidae, variety of raptors, wood storks, all estuarine/maritime wading birds; manatees, dolphins, pelagic whales (northern right). I can be made available during week with appropriate notification/lead time. I live south of Tallahassee Florida. The St. Marks National Wildlife Refuge is at my doorstep. We have seen bears, bobcats, raccoons, wild pigs etc. But the birds are fabulous. I am an amateur photographer and can spend all day out there. Also, we kayak a lot so we see birds you normally do not see on some trails. A birder for just two years with 450+ life birds and growing fast. Love to talk and birds. Simi-retired physician assistant with no plan to ever retire completely. My wife is my best friend and Ziggy (Jack Russel terrier) is my second best friend. My great regret in life is that I didn't become a birder unit I was 68. Oh the wasted years!. From living out west near Sun Valley for twenty years to sailing from South Africa to the US and then circumnavigating the Caribbean with my wife for three years. All those island nations and all those birds! But I can claim only a few. I'm beginning to carry my binoculars with me everywhere I go to make up for lost time. Our Lakeland home is on Lake James, a small lake just off I-4 about 35 miles east of Tampa and 40 miles west of Orlando. Our Englewood home is on the Central Gulf Coast about 25 miles south of Sarasota. We will spend most of Jan., Feb., and March in Lakeland. During the rest of the year we could be at either location. My little lake has many of the egrets and herons and other fowl. Nature: birdwatching, sprint triathlons, swimming, walking, hiking, biking, long quiet walks. Travel: sailing the Caribbean, anywhere with birds peace and quiet. 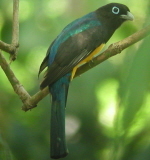 Birding in Guatemala and Panama last spring. Costa Rica soon and Alaska, Seattle bay islands and Glacier National Park next summer. Birding 60 years and author of eight books about birding on Nantucket. Available May and early June, then Sept through mid Dec. If you e-mail me I'll either help you or link you up with someone who will. Nantucket is just over 40 square miles, you are never more than a mile and a half from the beach. This would work for Englewood, FL. Birding 60 years and author of eight books about birding on Nantucket, plus edited to editions of A Birders Guide to Georgia. Available mid-December until mid April, then July and August. If you e-mail me I'll either help you or link you up with someone who will. SW Florida is filled with very observable birds that seem much tamer here than up north. Please remember our heroes returning from Iraq and Afghanistan! Retired State of Florida employee. Have been bird watching for more than 15 years. This area has excellent bird watching in Paynes Prairie, especially in winter. There are many nature parks nearby. The Atlantic and Gulf of Mexico coasts are only 1.5 hours away. Retired after 35 years as a wildlife biologist working with birds in Florida. Happy to show folks birds in North Central Florida. We live just north of Paynes Prairie Preserve State Park, one of Florida's top birding sites, especially good in the winter for Sandhill Cranes, waterfowl and sparrows. My wife and I are ornithologists and frequently lead walks and give talks at birding festivals. 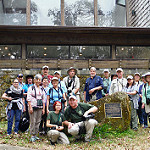 Birding in Ocala National Forest and Emeralda Marsh. Our general area of Florida as well as the state is known for attracting birders from all areas. I have only just become interested in the last 6 months and spend allot of time on walks and photographing birds. SE Florida has a number of places to hit, some of my favorites are the water reclamation areas in Delray Beach. I will also sometimes wander over to Sanibel Ispand and Merrit Island eventhough those places are a bit far away. Tigertail Beach on Marco Island is part of the South Florida Birding Trail. The beach is part of the County Park system, with a natural lagoon, and short walk to the Marco river or the Gulf of Mexico. The crescent beach is one of seven in the world. Mangrove forest, mud flats and sea grass supports a number of different species. Considered one of the best birding sites in Southwest Florida. Some of the birds you may find, Wilson's, Piping and Snowy Plovers, Least Terns, Roseate Spoonbills, Red Knots, Osprey, Falcons, Bald Eagles and Pelicans. I am seventy nine years old retired aerospace quality assurance specialist. (aerospace). I worked thirty three years for the us air force auditing contractor quality assurance programs and the operational condition of equipment and facilities assigned to them. Worked the the heavy lift titan heavy missile. Traveled to several foriegn countries. Japan, Okinawa, South Africa, The Congo, Surinam and England. Hobies include birding photography (ameture), fishing and flying. Spent two weeks in Alaska in search of good Puffin photos. No luck due to the weather. Southwest Florida-destination for many birds. I've been birding since I was eight years old. I just moved into this area, but have found some really good birding sites. We live near the northern entrance to the Canaveral National Seashore Park. The Mosquito Lagoon is our back yard and the Atlantic Ocean in the front. We frequently go birding in the Merritt Island National Wildlife Park and the Vierra Wetlands to the south. I am also a amateur photographer with experience in digiscoping. I am 45 minutes south of Daytona Beach, and 90 minutes northeast of Orlando. Excellent birding opportunities in the SW coastal area of Florida. Summer is not the best time but there are interesting resident birds here. Not a serious watcher but very much enjoy it when I go. I live near the Intracoastal Waterway; have kayak access. Year round cardinal families; hummingbirds in season; Black-throated blue warbler arrives every year in my yard on (nearly) the same date! Reclaimed water "Parks" are about one hour away (in Palm Beach County)for wonderful for birding and photography. When I'm traveling in my new to my rv (Florida summers) I would love to meet up with other birders in other areas. This Oct. I will be going to Vermont for several weeks - St. Johnsbury vicinity after visiting family on eastern Long Island. St. Marks N.W.R. I am a rank amateur but am very familiar with the area. Birding guide/pal within 25 radius of Tallahassee fl. any day of the week. 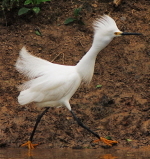 Can provide birding hotshots, places to dine and sleep. I am also interested in photography and am available for kayaking in rivers or gulf. I have been a birder for almost 50 years and have birded the US, (including Alaska and the Pribolof Islands), Trinidad and Tobago, Canada, South Africa, a little in China and England. I have been a volunteer for United States Fish and Wildlife Service at Merritt Island NWR for over ten years and a leader of field trips for other organizations for forty years. Merritt Island Nat'l Wildlife Refuge, Viera Wetlands, Orlando Wetlands, et al. Nature, birdwatching, herpetology, wildflowers, mammals, twitching, photography, hiking, butterflies, sport fishing, cross country skiing, canoe and kayak, classical music. Visit: Museums, outdoor nature spots, beaches, lakes and oceans. We are volunteer bird guides in Lehigh Valley, Pa from May to November and in Venice, Florida from November to April. We will lead tours anywhere in the state with arrangements in advance but focus mainly on Central Florida. Avid Birder for last 12 years with 333 species in Florida. 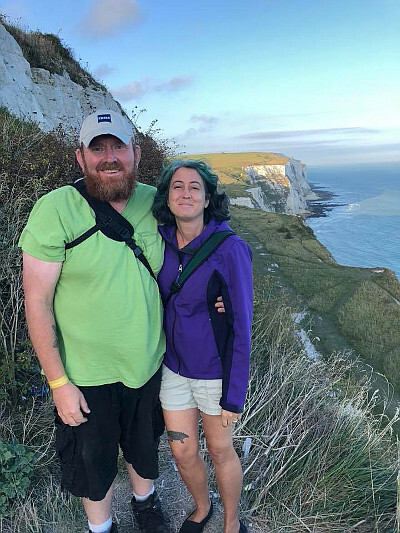 Since 2000 during her first internship studying Dotted Skippers and Diamondback Terrapins in Cape May County, NJ, her passion for biodiversity spread from entomology and herpetology to birding. A Certified Master Naturalist, a bird bander with the Wekiva Basin Banding Station until 2017, she participates as a volunteer in Jay Watch, NABA butterfly counts and Christmas Bird Counts. She served 2 years as an Oklawaha Valley Audubon Society board member and coordinating that chapter’s field trips. She brings a diverse knowledge of all of Florida's fauna, is an amazing photographer, and loves insects, especially beetles. Rebecca brings a passion for all things nature and her love of birds, butterflies, and insects is contagious to all those who go out with her. With her long resume of jobs in biology studying everything from Clapper Rail to Red-cockaded Woodpecker and you won't find anyone more knowledgeable or passionate about what she does. Began birding at Hawk Mountain Sanctuary in PA watching raptors in 8th grade which began his love of hawks. That soon changed after receiving a Golden's Field Guide that he paged through till he came across the wood-warblers and saw the Prothonotary Warbler which launched him into the world of birding. Since then he has been the hawk counter at Bake Oven Knob in PA, during his time here he was published in American Hawkwatcher for a paper on Migrating Cooper's and Sharp-shinned Hawks and in conjunction with Hawk Mountain Sanctuary, and Mountclair in NJ. Arriving in Florida in May 2005 to work for Dr. Reed Noss of UCF doing Radio Telemetry and banding of the critically endangered Florida Grasshopper Sparrow. This eventually lead to his current job with Lake County Office of Parks & Trails where he performs quarterly bird & butterfly surveys on five conservation properties. Over his time with with Lake County he was on Birding Adventures with James Currie and was Keynote Speaker for 2015 Wings & Wildflowers Festival. In his spare time he is the eBird reviewer for Lake and Sumter Counties, co-compiler for Zellwood-Mt. Dora CBC, eBird Hotspot Reviewer for Florida, and was Lake County Coordinator for Florida BBA 2011-2016. With this background Gallus brings the details, with quality eBird checklists made at every stop and a knowledge of the when and where to find birds. His background also means he has a vast knowledge of local ecosystems and thank to Rebecca is becoming a butterfly enthusiast and better photographer. If interested in Dry Tortugas Trips we do guide work through Florida Nature Tours which offers best guides, boat, and price of anyone leading trips there. Central Florida is home "the mouse" but also is amazing for birding and is nicely situated to reach birding spots on both coasts in less than 90 minutes. 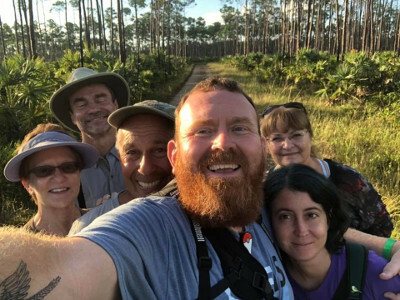 It holds the largest concentrations of the endemic Florida Scrub-jay as well as several of the top birding locations in the state, if not the entire U.S. including Merritt Island NWR, Lake Apopka North Shore, and Fort DeSoto Park. I have been a professional Naturalist for 35 years in South Florida. I am the Coordinator of the Everglades Birding Festival, lead Audubon trips, bird festival speaker/leader and teach many bird i.d. classes. I can find the rare/life birds you seek, but more importantly my strength is teaching you to identify them by gaining advanced birding skills. It helps if you know what target birds you are seeking or what places you would like to visit (Everglades, Corkscrew, Keys, South Dade, etc..)in order to plan a successful day. Let's Go! I am a professional wildlife photographer and outdoorsman, 40 years now. I take people on private Guided Wildlife and Birding Photo Tours into the Everglades in Florida. Birding here is exceptional, as many species winter in the relative warmth of the South Florida wilds. Owing to both an abundance of wildlife and comfortable conditions, the dry season, December through April, is the best time in the Everglades. This is a full day's trip starting early in the morning. You will be hiking down wilderness trails teaming with wildlife and many birds. On my Photo Website you will see images of some of the wildlife and birds you may see on the trip. You will have so many good sightings and a very safe and enjoyable time. You will like my informative but fun, pleasant and upbeat personality. You pay all expenses from Miami and back, car rental, gas, tolls, entrance fees, meals, etc. If you would like me to guide you into the Everglades for a day you are most welcome. Please contact me and I will let you know availability and send you a complete itinerary of the day's tour. These hotels love birds and all who love them.